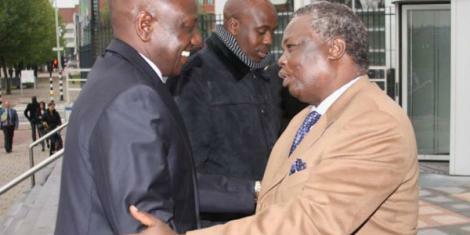 Sunday April 14, 2019-Central Organisation of Trade Unions (COTU) Secretary General, Francis Atwoli, has hinted at a lot aimed at Kicking Deputy President William Ruto out of the ballot come 2022. Speaking at COTU fundraising for Lamu Women's SACCO, Atwoli assured the masses that Ruto's name would be conspicuously missing because the Constitution will have changed. He further revealed that the elections would be much peaceful and that in their aftermath, Ruto's allies would be kicked out of Government. "Nami nataka kuwaambia kitu moja, jina la William Samoei Ruto halitakuwa. (And I want to tell you one thing, William Samoei Ruto's name will not be there.) You can take it to the bank for free," he stated amidst cheers from the crowd.